This machine arrived at the F&C workshop about six months ago since when it's seen a fair amount of action, so this ranks as a long-term test allowing us to give you a better insight into its capabilities. The first problem was installation, not so difficult you might think but, once the heavy top section is bolted to the pressed-steel base, it is almost impossible to raise it into the upright position. This gives you an idea of how heavy it is, so don't attempt it on your own. We bolted it to an MDF base at which point it was easily skidded into position. This is not a cutting edge all-singing-all-dancing digital workcentre, but a basic, very heavily built, conventional chisel mortiser with a fairly compact footprint. One of the few concessions to modern design is the use of a gas strut for head return instead of the old-fashioned but effective heavy weights on a steel rope and pulley. 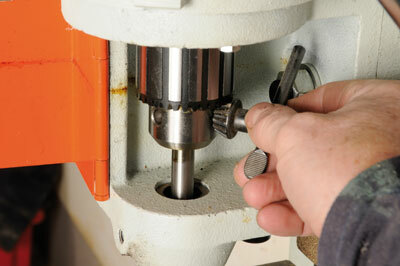 Like any chisel mortiser it requires an amount of adjustment before use. The induction motor is quiet and has the usual heat sink casing enabling it can keep cool under heavy load. 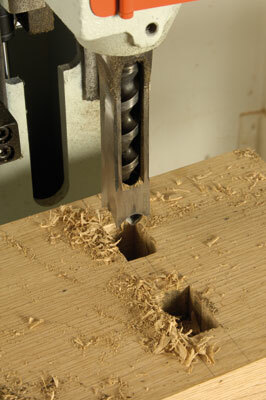 The dovetail slideway on the column was the first thing to get right as the lever action was far too stiff. Loosening of the bolts fractionally and working the lever arm until smooth, then retightening them, did the trick. Likewise the bed slideway needs a little bit of adjustment and some lubrication for a smooth action. 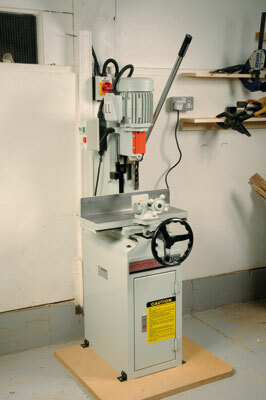 The all-important work vice is heavily built and ground flat and square with a removable cover in the base for through-mortise work done without a sacrificial board in place, though frankly you shouldn't work without one. The movable jaw assembly can be repositioned and allows a lot of pressure to be applied which is crucial to prevent workpieces being dragged upwards on the return stroke. All the vice slide movements are controlled with the large front handwheel although front-to-back motion needs a push or pull action on the handwheel to make it function or not. This changeover action wasn't consistently easy and could be better although it may improve over time as the mechanism develops slight play. The movements can be locked and the length of a mortise can be limited as well for repetition accuracy. The head assembly has a depth stop rod with a large Bristol lever to ensure it tightens properly to prevent slippage. Its two stages allow different cut depths including haunching. The chuck for the auger shank is accessed by a screw-closed door although I believe it may have been substituted for a knob in newer models. 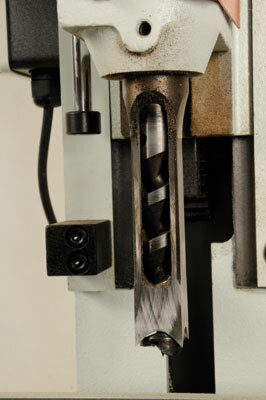 The chisel is held in a collar in the head casting and can be interchanged with sizes to suit the chisels being used. If you have not used a mortiser before it is worth noting that, as normal, the augers need to have their shanks cut or ground off to suit the chuck and collar assembly. 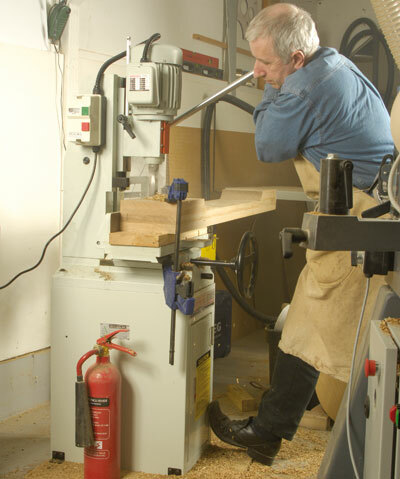 The very first job I did with the STM25 was large mortises in 90mm-thick oak. I used the largest chisel, a new 25mm one, and adjusted the auger so it cleared the chisel comfortably. Even so it was hard work and created a bit of smoke. Technically this was beyond its capacity in hardwood. Smaller chisels worked better and in no case did the motor fail although it was clearly under strain with the large deep holes. 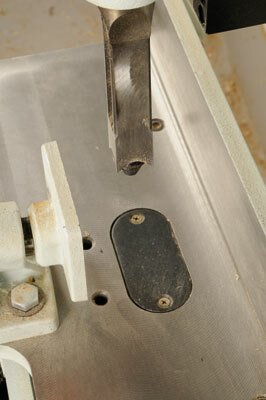 Remember though that mortises need to be done in stages, withdrawing the chisel to clear the chippings as you go. Big, mean but reliable might sum up this machine. Most of the time it sits out of the way taking up little space, but is there when a batch of mortises needs to be dealt with. 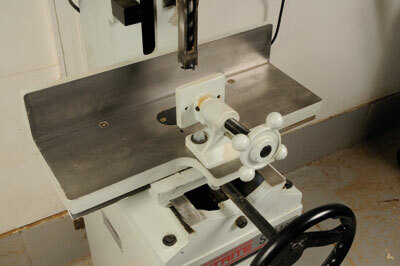 The vice is deep enough to hold awkward workpieces and secures them tightly which is so critical. At the current price this seems like a good way to invest in modern cast iron. "Big, mean but reliable might sum up this machine"